Wednesday was our last day of sessions at the IHL course, and during these we had a chance to look more into implementation and prosecution than in previous sessions, which was quite useful and a nice way to wrap up the course. We had a discussion about the various points of implementation, including during peace and during war, preventive measures and consequences. We also talked about the non-legal elements that contribute to respect for IHL, which for me can be some of the most powerful deterrents to violations and reasons to uphold the law, including feelings of honor and duty, respect and support of the civilian population as a basic level, reciprocity, and to facilitate rebuilding after the conflict ends. Our final session was on crimes; a fantastic session which really helped me understand the nuances in different types of crime classification and an historical perspective on prosecution. It’s easy to be confused by the differences between war crimes, grave breaches, crimes against humanity, and genocide – often these terms are used interchangeably by those outside of the field of law, but they all carry distinct definitions, based on the type of crime being committed, the circumstances surrounding it, and the victims or targets of the crime. There was also a chance to speak briefly about individual criminal responsibility, that as an individual you have the duty to not only follow lawful orders, but the duty to NOT follow unlawful ones. This is an important point, and one that often gets glazed over, but an important reminder that there is a great deal of responsibility at the individual level for upholding and respecting IHL, not just at the state level, and drives home the importance of IHL dissemination during both wartime and times of peace. 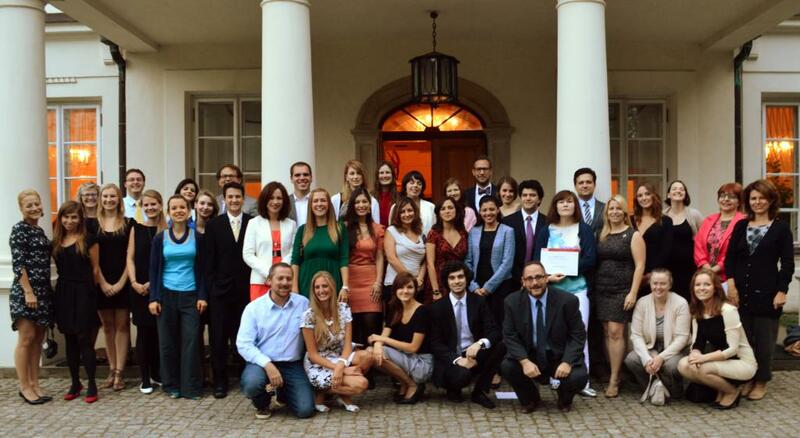 This is my last post on the amazing experience that was my ICRC IHL Course in Warsaw this summer. It’s been a couple of weeks since I got home, and I’ve had even more chance to reflect on my time there. The last few days went by too fast; my fellow participants and I did a great deal of bonding in those ten days and in addition to the outstanding course sessions, guest speakers, and our hosts from the ICRC and Polish Red Cross, I feel as though I’ve made some great friends among my colleagues in the field of IHL, including several from other Red Cross National Societies. I look forward to our continued conversation and collaboration in the coming months and years. On Monday, we began our second set of classroom sessions, again with some fantastic guest lecturers. To talk about all of them would be too cumbersome here, so I will again hit on two of my personal favorites. Yesterday afternoon we had a fascinating discussion on persons deprived of liberty, including POWs and other detainees, opening with a discussion of whether a particular situation can be neither legal nor illegal, with Guantanamo Bay as the sample. As an American, I felt a bit awkward at first during this discussion, but found that my perspective was shared by others in the room and that my thoughts on the subject were sought specifically because it’s such as controversial issue. We had a long discussion about the various bodies of law that can be applicable in the regulation of detention, including IHL of course, but also Human Rights Law, Refugee Law, national laws, Law of the Sea, International Constitutional Law, and state responsibility for injury to aliens. Some of these were quite new to me, not having a legal background, and I was grateful for this discussion as we talked about the various circumstances under which someone could be detained and how that determines which of the laws apply, and therefore how the person(s) are protected, treated, and possibly prosecuted. One of the things this course as a whole has really helped me to understand is this broad field of international law – I had a tendency to think of IHL in its own bubble, sometimes considering Human Rights Law or Refugee Law, or very specific UN Conventions, but I have a new appreciation now for how broad this field is and how difficult it can be at times to determine what is applicable given the complicated circumstances that arise in real conflicts. On Tuesday morning, we were treated to a lecture by Marco Sassoli, an esteemed expert in the field of IHL and co-author of an amazing resource: How does law protect in war? Cases, documents, and teaching materials on contemporary practice in international humanitarian law, published by the ICRC. Sassoli spoke about non-international armed conflict (NIAC), which, as I’ve mentioned in a previous post, is a much stickier conflict classification than international armed conflict (IAC), under which the laws are more elucidated. Many states consider NIAC and IAC to be profoundly different circumstances, but humanitarians made a push for greater inclusion of NIAC in IHL because they felt fighters and other affected by NIAC should be afforded the same protections as those in IAC, which largely resulted in the development of the Additional Protocols of 1977. This session was particularly useful to me, having not had the opportunity in the past to spend much time thinking about the legal differences between persons involved in NIAC vs. IAC, and how those legal differences result in different protections afforded to those affected by conflict. This is made even more complicated by the fact that while the Geneva Conventions of 1949 have been universally ratified, not all states are parties to one or both of the Additional Protocols of 1977, so determining status and protections can be much more complicated than I appreciated before. Yesterday we went to Auschwitz. 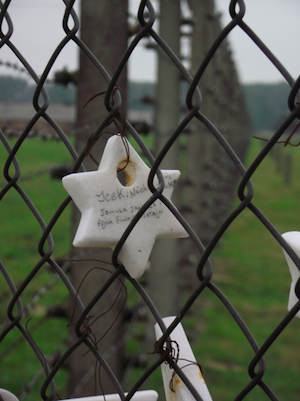 I had never been to any of the concentration camps before, and it was a wholly sobering and powerful experience. From the perspective of the IHL course, it really brought a more personal element to the discussions we’ve been having – in the study of such things it is often too easy to slide into hypothetical conversations without keeping at the forefront the notion that we’re talking about real people in extremely difficult circumstances. After our day walking through the actual spaces of Auschwitz I & Auschwitz II-Birkenau, I think all of us were that much more mindful of the realities of what we’ve been discussing. It was somewhat surreal for me standing in the same space where such atrocities occurred, where people lived in such conditions. The main part of the tour, at Auschwitz I, was conducted by a guide who spoke through headsets tuned to a particular station. This really suited the mood of the experience, because rather than having large groups of people chatting with each other in groups led by loud, shouting tour guides who needed to be heard above the noise, all you heard in your ears was the relatively soft, calm voice of the guide, and even if you took your headphones off for a moment, none of the visitors were speaking with each other, which left the overall sound level amazingly quiet throughout the whole tour. This seems more appropriate, somehow. There were two things there that gave me a great deal of pause. First was the rooms full of personal belongings that had been taken from those who were sent to the gas chambers. Piles and piles of pots & pans and other household items, empty suitcases, eyeglasses, shoes, prosthetic limbs, and even human hair. I vaguely remembered having learned or read that everyone’s head was shaved, but seeing it in a big mound like that… Then also there were photos lining several of the hallways. Photos of everyone taken at registration, many of them having transferred in from other camps. This was before they began giving everyone tattoos with their numbers on them, which they apparently started in part because taking photos of everyone was getting too expensive. The pictures, though. Everyone with their head shaved, wearing the same clothes – there was this eerie sense of uniformity, of people being stripped of their individuality. All of the photos had captions created after the fact, for display – with their name, country of origin, occupation, date of arrival, and date of death, if applicable. Which it was in nearly every photo we saw. At the site of Auschwitz II-Birkenau I was struck several times by the sheer scale of the place – it was enormous. The buildings just kept on going, stretching building after building. And the train tracks, the place of arrival for everyone, right in the middle, near the main guard tower. The trains would stop just inside the entrance, but the tracks kept going, hundreds of feet out I am grateful for the opportunity to have visited this place, despite of, or because of, how emotional the visit may have been. We’re wrapping up our first week here, and the past 2 days we’ve had some major highlights in the discussion as far as I’m concerned. I feel like I couldn’t possibly do justice to all of our speakers and guests and the intricacies they’ve brought to the table, so I’m picking and choosing based on my own personal interests. Yesterday we looked at the intersection between IHL and Human Rights Law, two bodies whose basic purposes are linked at a basic desire to protect vulnerable populations and ensure human dignity. Our speaker from the United Nations Office of the High Commissioner for Human Rights sparked some heated and fascinating discussions regarding the application of the two bodies of law depending on specific circumstances. The discussion, of course, revolved around when these two bodies of law convene: Human Rights Law, concerned primarily with how states treat their own citizens (or individuals within their territory) and IHL, concerned with protecting civilians and other persons hors de combat (out of the conflict) during times of armed conflict. There are pieces of both that are arguably applicable simultaneously – so how does one determine which set of rules prevails? It’s a complicated discussion, including considerations of lex generalis and lex specialis that veer farther into legalese than I would normally be dealing with. Today, we were treated to two outstanding discussions, one on the conduct of hostilities and one concerning weapons and issues of targeting. Both were absolutely fascinating, revolving around the concepts of achieving goals from the military perspective while still abiding by IHL and honoring the principle of distinction. Conducting hostilities is a matter of balancing decisions in terms of what is considered ‘excessive’: balancing military necessity and humanitarian concerns. Operationally its quite difficult because you’re talking about rules that have to be applied, and in practice they are applied under a great deal of pressure and in the heat of the moment. These decisions are inherently about life & death which adds an extra layer of difficulty and importance. Here we focus on three basic principles: distinction, proportionality, and precaution. The starting point for our afternoon session on weapons was that it’s not a question of the legality of each weapon specifically, but about how we can take into account all of these issues we’ve been discussing (particularly distinction, proportionality, and precaution) when making decisions about which weapons to use in any given situation, and how to target them and deploy them. The most important part is how it really works in the field during a dynamic targeting process. We discussed the concept of “the dilemma of the strategic corporal”. This is the notion that leadership in complex, rapidly evolving mission environments devolves lower and lower down the chain of command to better exploit time-critical information into the decision making process, ultimately landing on the corporal, the lowest ranking non-commissioned officer. This was followed by a fascinating discussion on the law of armed conflict (LOAC) and two cardinal principles of 1) no indiscriminate attacks, and 2) no unnecessary suffering. An interesting piece to look at for more information is the Rules of Engagement Handbook, from the International Institute of Humanitarian Law, developed in Sanremo in 2009. It’s been an engrossing and active first week. This weekend we go on an excursion offsite, and the Krakow for a brief break before we get back into sessions on Monday. We arrived at the Palace Radziejowice on Monday, and official sessions for the International Humanitarian Law (IHL) training course began yesterday. Even though it’s been only two days, I am already highly impressed with this course, the level of discourse, and the expertise of not only our presenters, but my fellow participants. Tuesday’s sessions began with a discussion on the scope of application of IHL, and the fundamental principle of distinction, which would inform our conversations throughout the rest of the course. I came to this course with a relatively basic understanding of IHL; my knowledge stemmed from my American Red Cross IHL Instructor Training (which I took in 2008) and the accumulated knowledge since then from IHL Instructor calls, online web seminars, news, and my own bits of research I would do to prepare for teaching the IHL course. Understandably, this leaves gaps, particularly considering that I have no formal legal training. So this course is already proving valuable in terms of fleshing out my understanding of things that to legal scholars would seem basic, but are things I hadn’t encountered before in my (relatively) limited exposure. For example, one of the challenges with IHL is the difference in its application between international armed conflicts (IAC) and non-international armed conflicts (NIAC). Depending on the classification of the conflict, different pieces of IHL may or may not apply, which is further confounded if the involved states aren’t signatories to the Additional Protocols. I had always thought of POW status and combatant status as applicable in all conflicts, but in our discussion on distinction I learned that these legal statuses are only applicable in IAC, which creates all sorts of challenges when dealing with individuals who occupy the same kinds of roles in NIAC, because they aren’t necessarily afforded the same protections or rights. Distinction poses one of the most fundamental challenges in the waging of conflict. Given the nature of conflict in today’s world, it has become very difficult to make distinctions. Civilians intermingle with combatants, there are fewer distinctive uniforms, and more informal (non-state) fighters. Which brings us to the concept of “direct participation in hostilities” (DPH), a term describing non-combatants who somehow cross the line and become active participants in the conflict. There has been a lack of criteria to distinguish peaceful civilians and those taking DPH. 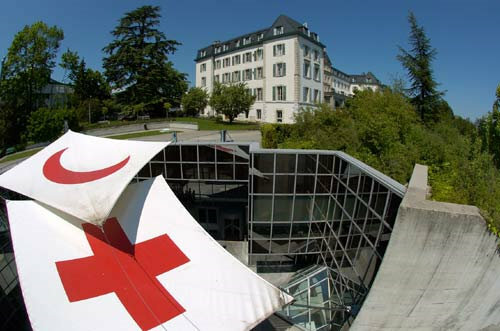 Within the past decade, the ICRC conducted a long study into the matter, creating interpretive guidance for this issue, to serve as recommendations for addressing this challenge. However, these guidelines don’t technically have a binding legal value, though some of the points contained in the guidance are beginning to become part of customary international humanitarian law. Already this course has given me a lot to think about and opened my eyes to some more of the complexities involved in the study and application of IHL. I look forward to delving deeper into these issues over the next week! 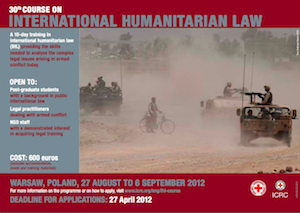 Earlier this year, I was lucky enough to be asked to apply for the 30th Course on International Humanitarian Law (IHL) organized by the International Committee of the Red Cross (ICRC) and hosted by the Polish Red Cross, bring held in Warsaw, Poland from 27 August to 6 September, 2012. I was selected, along with the new IHL legal counsel from National HQ to represent the American Red Cross at this prestigious training course. 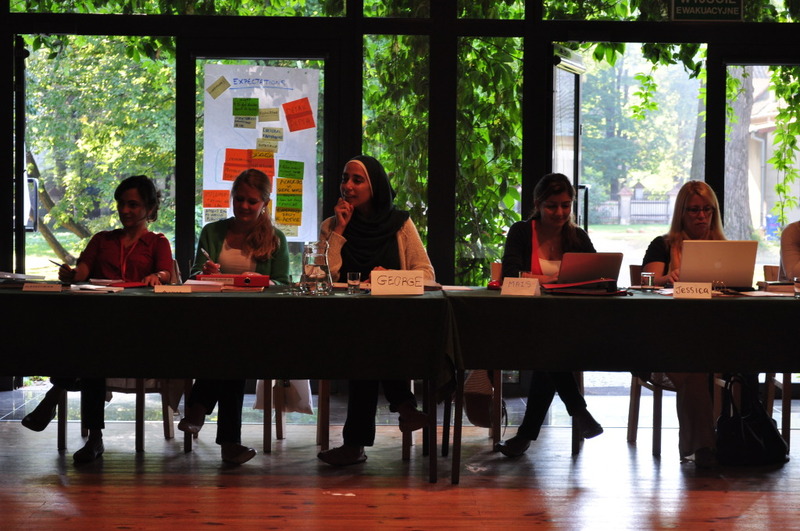 The course is 10 days of intensive study in IHL, including 32 participants from 24 countries and a variety of backgrounds, including a number of Red Crossers, of course, but including others from various Ministries, MSF, HRCand other NGOs, as well as PhD and law students from several universities. It’s being held at Palace Radziejowice, 40 km outside of Warsaw. I arrived in Warsaw on Sunday, 26 August, with just under 24 hours before I needed to report at the Polish Red Cross office and meet my cohorts. I did get a chance to do some sightseeing in that time, which I was grateful for, never having been to Poland before, or indeed, never being this far east in Europe before. After arriving at the Polish Red Cross office on Monday afternoon, I began to meet the rest of the participants who I will be sharing the next 10 days with, including my to-be roommate, Hanneke from The Netherlands. After a long drive through rush hour traffic we arrived at the Palace, were shown to our rooms, had a nice light dinner and did some socializing, introducing ourselves and sampling food and drink specialties from across the nations represented. Then we all retired to rest up (and try to recover from jet lag) before our first full day of the course.